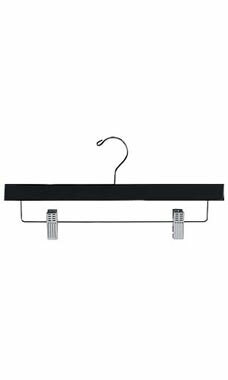 If you're looking to upgrade the hangers in your retail store, these sturdy 14" black wooden pant/skirt hangers are an excellent choice. Adding a stylish complement to your collection of essential store supplies, these wooden hangers will highlight any garment in the most complementing fashion. Constructed with a silver metal hook and clips on which to hang skirts and pants, these hangers are incredibly strong, durable, and economical. Sold in cases of 50 at wholesale prices!